USA Today bestselling author Gayle Callen creates an unforgettable story of mistaken identity and irresistible attraction in this first in a wonderfully engaging series set in the Scottish Highlands. Shaken from sleep during the night and bundled off to the Highlands by a burly Scot, Riona is at first terrified, then livid. Hugh McCallum insists they were promised to each other as children to ensure peace between their clans. 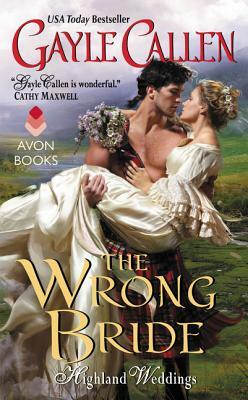 The stubborn laird refuses to believe he's kidnapped the wrong Catriona Duff. Instead, he embarks on a campaign of slow-burning seduction. At first, Hugh cares only what their marriage can do for his people. Now he's starting to crave Riona for her own sake, but her true identity jeopardizes his clan's contract. And unless she chooses to risk all to be his bride, he'll lose the only thing he prizes more than the lands he's fought so hard to save—the passionate marriage they could have together.